We compare the investment proposition of the legacy company with the company spun off in 2016. 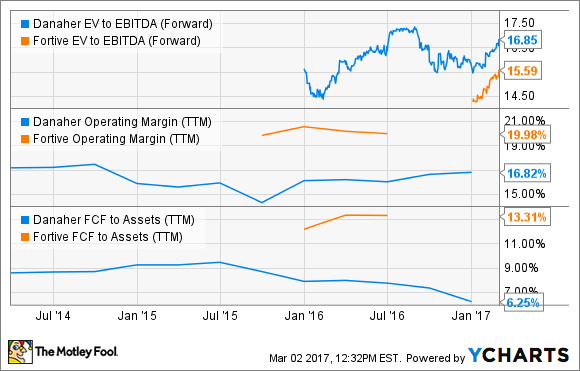 Which stock is more attractive in 2017, and why? Danaher Corporation (NYSE:DHR) vs. Fortive Corp. (NYSE:FTV) makes for one of the most interesting comparisons in the industrial sector. Of course, there is nothing stopping you from owning both stocks -- in fact, before the spin-off of Fortive in July 2016, investors did own both businesses as a set -- and certainly their differing investment propositions would provide diversification.However, the split has created two significantly different companies, so let's take a look at the contrasting investment cases for the two stocks. The rationale behind the spinoff was the creation of two separate companies, with differing investment profiles, in order for their management teams to better focus on growing their respective core businesses. Essentially, Danaher now consists of the legacy company's life sciences, diagnostics, dental, water quality, and product ID segments, and the acquired Pall Corp. (mainly life sciences) and Cepheid (diagnostics) businesses. Fortive comprises the legacy company's test and measurement, retail fueling, telematics, and automation businesses. There are three key differences between the two companies. First, around 80% of Danaher's revenue comes from life sciences, diagnostics, and dental end markets. In other words, it's arguably not an industrial stock anymore, and has relatively defensive end markets. Meanwhile, Fortive's motley collection of industrial businesses should give far more exposure to the cyclicality of economic growth. Considering that most forecasters are predicting a pickup in industrial production growth starting in 2017, and President Trump's emphasis on infrastructural spending and supporting US manufacturing would indicate that Fortive has more potential for upside surprise to its earnings in the next few years. Meanwhile, Danaher's end markets, although strong, don't have much cyclical upside, so if you are specifically looking for exposure to a the potential of a stronger economy then Fortive is the better choice. Second, the legacy Danaher company was noted for its acquisition strategy. This largely involved buying unloved companies and applying its so-called Danaher Business System (a set of lean manufacturing and continuous improvement principles) to them in order to raise their margin and return on capital. Rather amusingly, Fortive is now calling its application of the same principles the Fortive Business System. These principles will look familiar to Fortive investors. Image source: Danaher Corporation. While the new Danaher and Fortive are following the same principles, their relative positions are different in 2017. For example, Danaher already has Pall Corporation (a $13.8 billion acquisition in 2015) and Cepheid (a recent $4 billion acquisition) to fully integrate, while Fortive is hungrily on the mergers-and-acquisitions trail this year. A quick look at both companies' fourth-quarter earnings reveals a lot about what to expect in 2017. For example, Danaher's core revenue grew 3.5% in the fourth quarter, acquisitions also contributed 4%, leaving reported revenue growth at 6% after a negative 1.5% foreign-currency impact is included. Meanwhile, core operating margin grew 170 basis points (100 basis points equals 1%) but was held back by a 50-basis-point reduction due to acquisitions, and a 40-basis-point reduction due to acquisition specific charges -- the end result was an 80-basis-point improvement. In short, Danaher's acquisitions hurt margin in the fourth-quarter, consequently its opportunity is to expand margins at the acquisitions going forward. On the other hand, on the recent earnings call, Fortive's CEO James Lico affirmed that new "M&A continues to be our main priority" in 2017, and he later argued that the 2017 outlook for 3% to 7% EPS growth "doesn't assume any M&A" and "we expect to deploy some M&A, and that's the thing I think is going to take our ... earnings growth up over the next year or two." The contrast in corporate strategy in 2017 is clear, Danaher is integrating, and generating organic growth this year, while Fortive is more hungry for acquisitions, and hoping those deals will help it grow in the future. As you see in the chart below, Fortive commands higher margins and free cash flow (FCF). This is highly relevant because it will need cash flow to deploy in order to make acquisitions, while Danaher's opportunity lies in expanding its margin and FCF generation, particularly as it grows its sales of high-margin consumables -- currently at 65% of total sales. DHR EV to EBITDA (Forward) data by YCharts. Based on the ratio of enterprise value to EBITDA, shown in the chart above, both stocks look more than fully valued. However, if I were forced to choose, I'd say Danaher looks the better bet. There is no shortage of stocks to buy to benefit from a cyclical recovery, so Fortive doesn't necessarily stand out there, and if the market keeps going up, then it's likely that Fortive will find it tougher to make the acquisitions it needs to get earnings growth into double figures in 2017. On the other hand, Danaher's secular growth prospects are compelling, even if its valuation right now is not. Danaher can grow its valuation in time via internal execution, while Fortive needs acquisitions and strong economic growth. The interesting thing about both stocks is that they would both look very attractive given a market slump -- Fortive would get to make acquisitions cheaper, and investors would get a better entry point into Danaher's long-term growth prospects. You may have to wait for this.